After hours of training, intrepid UTB explorer Sasha Arms is ready to take on all 13 museums of Frankfurt’s famous ‘Museumsufer’ embankment… The question is, are they ready for her? I practised my strategy for the Museumsufer challenge for several arduous days before my visit to Frankfurt. My friends wondered why I carried a pedometer and can of Red Bull everywhere I went, cracking my knuckles and straining to observe, write, walk and look interested, all at the same time. The reason? I was preparing for a Shackleton-esque endurance expedition. Not of the great man’s 1914 Imperial Trans-Antarctic Voyage variety, but of the how-to-get-around-thirteen-museums-on-the-Frankfurt-riverbank-in-an-afternoon kind. I left for Germany believing my place in the history books was all but assured. The key to any successful expedition is to of course be prepared. Fully aware that this slate-grey railway station might be my final opportunity to take care of some key human functions in relative comfort, I took advantage by spending a penny (for 50 cents) in the ladies’ and buying a Bockwurst croissant from ‘Le Crobag’ – a fast food bakery that’s not quite sure if it’s French or German. Handily, the tourist information office is also in the station, where a strict but helpful employee peered over her glasses at me and gave me some economical advice on how best to embark on my challenge, pointing me in the direction of a two-day Museumsufer pass for 15 euros – great value, even though I’d only be able to use it on my one afternoon in the city. As well as selling me my ticket, she also very helpfully handed me a print-out listing the museums that were closed. Luckily, only one of them was on the riverside. Thirteen museums became twelve, but the trek ahead would still be Shackleton-worthy, I told myself. 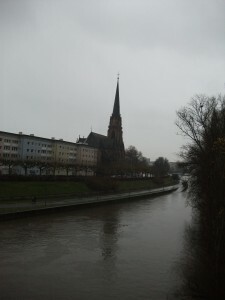 The bleak November day hung over the deserted streets of Frankfurt. While Frankfurters themselves were tucked away at work in their high-rise offices, I was wending along Baseler Strasse, past the Westhafen Tower that apparently has an uncanny resemblance to an apple wine glass (I can’t see it myself), and over the River Main via Friedens-Brücke, or ‘Friedens Bridge’. I passed just one person on the way. I may as well be in the Antartic, I thought. Not far from the bridge on Schaumainkai is museum number one – Museum Giersch – found in a splendid neoclassical villa, 1,626 steps away from Hauptbahnhof train station. Another bespectacled and strict German welcomes me in, but banishes my handbag to a locker all the way downstairs in the basement. Valuable time and footsteps later, I set off on my lap around the museum. Museum Giersch is a niche museum, dedicated to art from the Rhine-Main region. While the ground floor exhibits form a permanent collection (grand paintings from artists in the region, and bizarrely, a room of chairs), the first to third floors are rotating exhibits, where the theme at the moment seems to be sculpture. Sculptor Fritz Klimsch is prominent, with a number of his human sculptures around the place, while animal sculptures by August Gaul are also popular. The great thing about Museum Giersch is that it’s not too daunting – it’s a manageable size and is relevant to the local area. 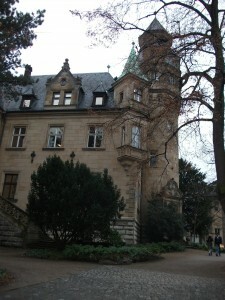 As with many of Frankfurt’s museums, the architecture of the building is also worthy of a visit in itself. It’s also perfect for a Museumsufer mission warm-up – 707 steps later and I’m waving goodbye to my baffled-looking friend on the reception desk, who has surely marked me down as his fastest visitor yet. Just moments (or 192 steps) along the river from Giersch is museum number two – the Liebieghaus Sculpture Collection. Yes, more sculpture, set inside probably the most impressive building on the route – the former private Villa Liebieg. 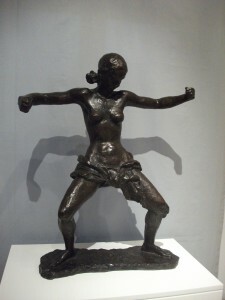 Sculptures from many ages and eras are featured, including the fabulously-named ‘Hideous Old Woman’, dating back to 1480, and ‘Naked Old Woman’, dated 1477. The real gem of the museum is the top floor, accessed by a narrow wooden staircase with deep red walls. The creaking rooms are laid out as you imagine they would have been centuries ago, and gives a peek into the lives of those who once lived there. I could have stayed up there for hours, peering out of the blurry glass onto the river below, but that’s not what one does on a Museumsufer challenge – so 1,080 steps later I’m hurtling off towards the next archive. I groaned when I first caught sight of the Städel Museum (374 steps from the Liebieghaus). It was huge. I practiced a few squats and lunges outside the entrance to prepare myself for a tough leg of the journey. Psyched up, I presented my Museumsufer card at the reception desk. For some reason, both receptionists were eyeing my left wrist suspiciously. I supposed they were wondering why I was wearing starched-white 80s sweatbands to their museum… I was left to ponder this, and a possible explanation, for several seconds, before I was informed that it was my umbrella, hooked around my wrist, that was the real culprit. Another energy-wasting trip to a cloakroom. Then, deep breath, go! Vast rooms of impressive art, from Botticelli and Rembrandt to Monet and Picasso, were studiously absorbed into my consciousness. I was surrounded by the world’s best, together with more recent artists’ ultra-modern creations, and…a hell of a lot of yellow, wellington boots. Confusing, to say the least. These yellow wellingtons were everywhere. There were even photos of German celebrities lining the walls, all wearing yellow wellington boots. Was my good friend Shackleton trying to get a message to me from his icy grave on the inhospitable island of South Georgia? Perhaps my expedition was simply not high-visibility enough? In fact, (with the help of some German translation), I was informed that this yellow welly exhibition was all about renovating the Städel, and was calling on everyone to get their fingers dirty and pitch in. After 915 steps and with a yellow welly sticker attached to my notebook, I scarpered. I’d soon find out just how poignant these brightly-coloured boots would be. Next stop: The Frankfurt Communication Museum (468 steps from the Städel). Now this is a cool museum, with brilliantly clever and interactive displays all about the media and communication. 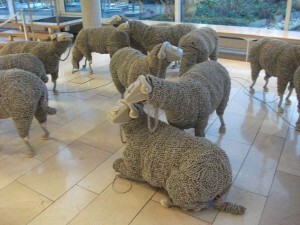 The ingenious flock of sheep in the lobby are made from telephones and telephone coils, whilst the one black sheep can be found rebelling from the rest of the flock around the corner. 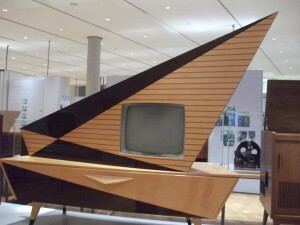 Other great finds in the museum are the KubaKomet TV, offering a vision of the future – as seen from the 60s, Salvador Dali’s lobster-topped ‘Hummertelefon’ and an array of mail-delivery vehicles and aeroplane seats. There’s also a fabulous cafe with loads of freshly-made cakes, and I wisely stocked up on calories. Shackleton would be proud – one explorer’s apple strudel is another’s raw seal flesh. Nine hundred and forty seven steps (and one piece of confectionery) later and I continued along the riverbank (another 249 steps) towards the Architecture Museum. This sounded like a particularly interesting project to me – I’d fore-read that the museum’s mission was to make architecture the subject of public debate, and housed exhibits called things like ‘House in House’. 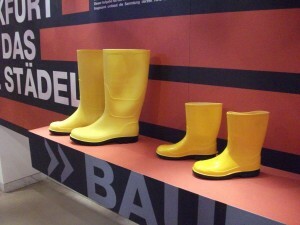 Sadly, all the Architecture Museum would mark for me would be the beginning of the curse of the yellow wellies. That’s right, a vast sign picturing the golden boots announced that the Architecture Museum was closed, ‘undergoing refurbishment’. The yellow wellies had beaten me to it. My friend at the tourist office had already informed me that the German Film Museum next door (17 steps) was also closed, so at least that disappointment didn’t come as a surprise. Summoning the spirit of Shackleton, I marched on defiantly. This expedition would still be a success yet. 426 steps later, I rocked up at the Museum of World Cultures. No yellow boots or scaffolding in sight. Win! …but no lights on either. After circling the building several times (523 steps), knocking on random doors, and peering through windows, I walked away from this cultural history museum, as forlorn as a lost hiker in the Antarctic would walk away from the mirage of a shelter and a warm fire for the night. At least the next museum on the journey offered some hope – the Bible House (892 steps). Promising to let me into the fascinating world of Biblical traditions, I hoped these traditions would include a good old-fashioned toilet and a cafe that, if it couldn’t feed the 5,000, could at least nourish one Urban Travel Blogger. But no, even Jesus had donned his wellies and closed for refurbishment. My challenge undermined, I marched, demoralised, the 1,211 steps to the next museum on the list – the Museum of Applied Art. Approaching the large building covered in scaffolding and tarpaulin, I felt sure I was about to hit rock bottom. Nearing the museum, however, signs told me not to be disheartened by the museum’s outward appearance, it was still open for business! A toilet and coffee break later, I made my way around the archive, displaying art in all its guises and from global cultures. Things might be on the up after all! Nine hundred and forty two paces later and I had a new spring in my step, despite some aching muscles from the day so far. ‘So far’ being the important words; I was off to the final museum on this side of the River Main before continuing my journey on the other side of the embankment. Despite the drizzle that was gaining in persistence, and the even more empty and greying streets, I was feeling really up for the Icon Museum (1,417 steps), which was to be found in a former monastery. ‘Closed for refurbishment’. The yellow wellingtons were really having a laugh now. Never mind, I seethed. 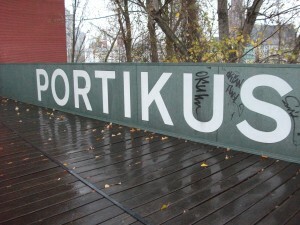 ‘Portikus’ sounds interesting. ‘Portikus’ (396 steps) is an exhibition hall for contemporary art, found on the ‘Alte Brücke’, or ‘Old Bridge’. I tried the door. Locked. I knocked, then hammered on the door. Amazingly, an apologetic-looking man opened it, revealing a building site inside. He shrugged and shook his head before closing the door. Closed for refurbishment. The rain was really hammering down now, saturating my mood as well as my boots (not yellow wellies, unfortunately). But there was still hope that the remaining two museums on the Museumsufer challenge would have me. The Historical Museum – Frankfurt’s oldest museum – 772 steps from Portikus. The green gauze hung off the scaffolding, getting slowly sodden with the rain. Closed for refurbishment. And finally, the Jewish Museum (811 steps) – museum number thirteen. Lucky for some, including me that day. It was open! 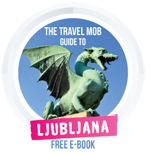 …and had 1,003 steps worth of things to see. Looking at Jewish life in Frankfurt, the collection includes a mish-mash of artefacts embodying Jewish culture, and looks at the experience of the Jewish community in Frankfurt right up until the twentieth century. The most engrossing pieces are those from the former Frankfurt ghetto, or Frankfurter Judengasse. Equally important is the ‘Oskar and Emilie Schindler Learning Centre’, which helps to commemorate deported and slain Frankfurt Jews. There are Jewish museums in all major cities across the world, and while Frankfurt’s version doesn’t rival some of the better-known global versions, it really does make for a worthwhile and fascinating visit. So that was that – the 12,643 step Museumsufer challenge – a strange combination of Frankfurt related art and culture, green tarpaulin and yellow wellington boots. Left slightly incomplete in places, I reminded myself that Shackleton never quite finished his Endurance Expedition either. I was still ruddy cheeked, achy-muscled, but conveniently I realised I had a bit of time on my hands as Frankfurt’s Christmas Market came to life.